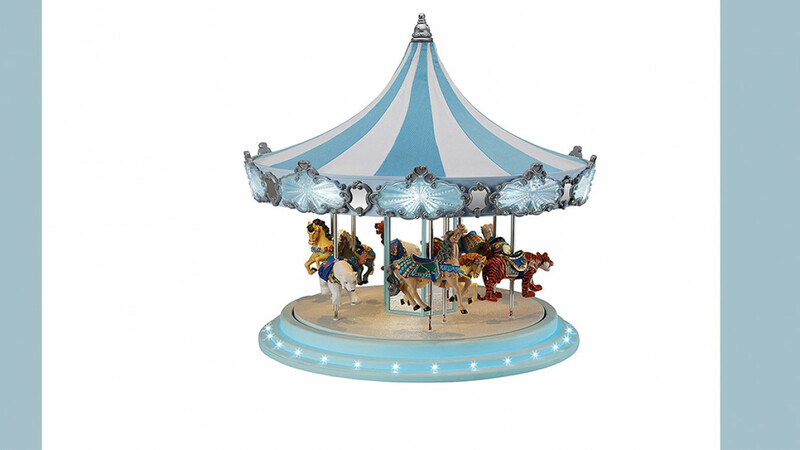 Add some magic to your Christmas decor with this beautiful sky blue carousel. A heirloom quality collectible piece that will become a treasured family holiday decoration. The illuminated roof is made from a sky blue patterned fabric, the lights can be changed from clear to colored at the touch of a button. All of the details are intricately designed and the mirrored centre column reflect the fine details as the carousel moves. The carousel measures 14-1/2"H with a diameter of 16 inches. This ornament is a wonderful gift idea for any family that can be passed from generation to generation as a reminder of past holiday seasons. Find out where to get it here -Mr. Christmas Frosted Carousel, 16"